Advanced Financial Management is an optional add-on item. If your agency doesn’t currently have this option and are interested in learning more, please Contact Support. These features eliminate the need to re-key financial data from extendedReach into an accounting system as well as the need to set up individual customer records within the accounting system. Keeping financial data closer to the case data in extendedReach increases accuracy and the availability of information to those who need it most. Program managers and administrators typically find tracking and managing receivables balances and detailed financial within extendedReach much easier than within an agency accounting system. These managers and administrators are also more likely to refer to the information on a regular basis, since it is easily accessible. You must be an Agency Administrator to access “Administration” on the left side of your Workspace. 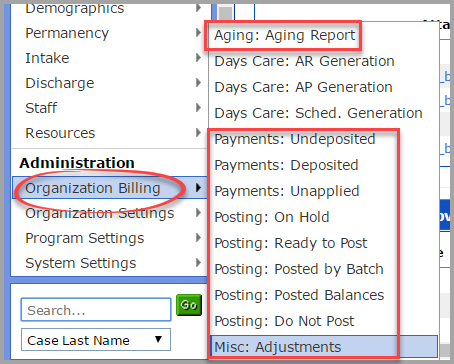 Hover over “Organization Billing”, and you will find multiple menu items related to this advanced tool. Once this feature is enabled (by extendedReach Staff) a “Financial” tab will appear on the case screen. 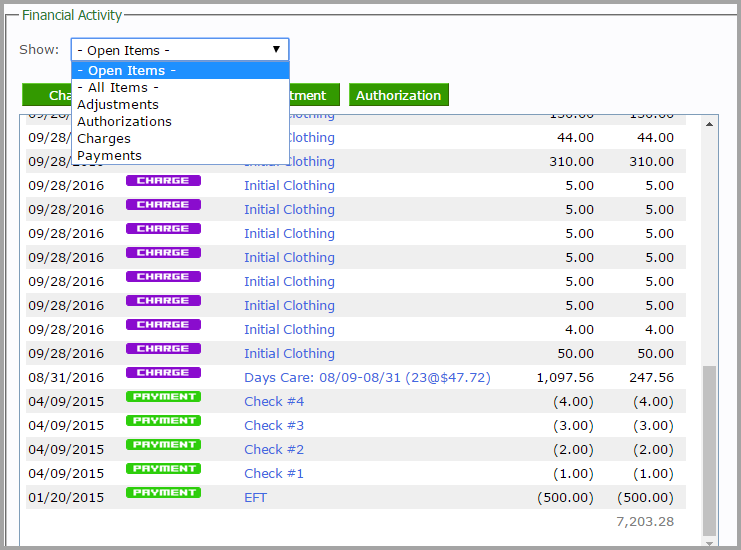 Various financial reports will also appear in the “Organization Billing” menu. The “Financial” tab is where Case Charges, Payments, and Adjustments are entered. For receivables, extendedReach can construct journal entries for each receivables transaction and post them directly to the accounting system through a text file export/import interface.